Priyanka’s entry into active politics is likely to pose fresh challenges to the ruling BJP that has won 71 of the 80 seats in UP. New Delhi: Priyanka Gandhi Vadra, the Congress general secretary incharge of east UP, arrived in Lucknow today for her visit to the politically crucial state after formally joining politics. 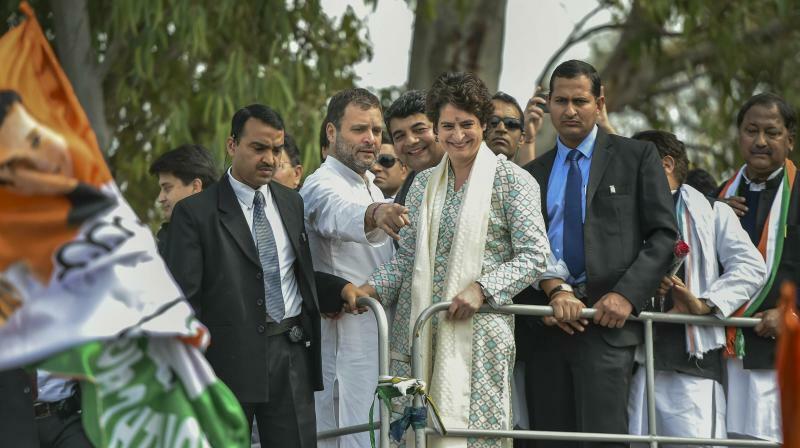 Accompanied by Congress president Rahul Gandhi and in-charge of the western region, Jyotiraditya Scindia, a beaming Priyanka Gandhi waved at partymen jostling for a glimpse of her. Congress workers have planned a roadshow for the three leaders when they travel from the airport to the party’s state headquarter. During the roadshow, Rahul Gandhi said, “I have made Priyanka and Scindia general secretaries of UP and I have told them that they should fight against the injustice done by current UP government." “ We will play on front foot not on back foot. Obviously, the aim is Lok Sabha polls, but I have told Priyanka and Scindia that the bigger aim is to win UP in 2022," Rahul added. The party in Uttar Pradesh is seeing the visit as the virtual launch of the Congress campaign in the state, ahead of the coming Lok Sabha elections. As her 'rath' rolled on, it was a selfie galore with enthusiastic partymen taking vantage positions to click prized photographs for posterity. When the trio embarked on a roughly 25-km-long roadshow through major thoroughfares of the state capital, rose petals were sprinkled and marigold garlands showered at their cavalcade. The grand roadshow is likely to and pass through places such as Hussainganj and Hazratganj before culminating at the Uttar Pradesh Congress Committee office. Priyanka and Scindia will stay in the state for next three days to hold meetings with office bearers and chalking out strategy for the upcoming Lok Sabha elections. Priyanka’s entry into active politics is likely to pose fresh challenges to the ruling BJP that has won 71 of the 80 seats in UP. This move by Congress came in the wake of a tie-up between the Samajwadi Party and the Bhaujan Samajwadi Party for the Parliamentary polls. However, Priyanka and Scindia have an uphill task in the most populous state of the country. The congress had secured only two seats in the 2014 Lok Sabha elections. Rahul at the headquarters of Congress UP unit reiterated that the party will fight the elections on its own in India’s most populous state which sends 80 MPs to the Lok Sabha. The Samajwadi Party and the Bahujan Samaj Party which announced an alliance last month, left the Congress put of it but said they would not contest from Rae Bareilly and Amethi - the Lok Sabha seats of Sonia Gandhi and Rahul Gandhi. ‘I respect Mayawati and Akhilesh Yadav, but Congress will fight with all its might in Uttar Pradesh,’ Rahul said.